﻿﻿ Some might have heard about Smart Dust; nanoparticles that can be employed as sensor networks for a rangeof security and environmental applications. Now, however, literal Smart Dust for the brain is being proposed as the next step toward establishing a brain-computer interface. This paper explores the fundamental system design trade-offs and ultimate size, power, and bandwidth scaling limits of neural recording systems. The investment in neuroscience has received a $100 million dollar commitment via Obama’s BRAIN project, while Europe has committed $1.3 billion to build a supercomputer replica of the brain in a similarly comprehensive and detailed fashion as the Human Genome Project mapped DNA. Concurrently, there is massive long-term investment in nanotech applications via the National Nanotechnology Initiative 2011 Strategic Plan. This 60-page document lays out a projected future “to understand and control matter” for the management of every facet of human life within the surveillance matrix of environment, health and safety. Twenty-five U.S. Federal agencies are participating. Nano sensors for use in agriculture that measure crops and environmental conditions. Bomb-sniffing plants using rewired DNA to detect explosives and biological agents. “Smart Dust” motes that wirelessly transmit data on temperature, light, and movement (this can also be used in currency to track cash). However, this is the first time that there is a working plan to apply Smart Dust to the human brain. Researchers claim it will be some time before (if ever) this is workable. One aspect that is interesting to note, is that once these particles are sent into the brain, it will be ultrasound that activates the system for full monitoring. This is an area of research that also has been looked at by DARPA as one of the future methods of mind control. Their idea is to sprinkle electronic sensors the size of dust particles into the cortex and to interrogate them remotely using ultrasound. 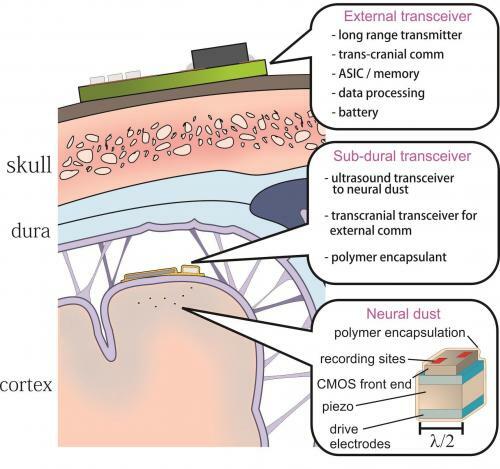 The ultrasound also powers this so-called neural dust. By contrast, ultrasound is a much more efficient and should allow the transmission of at least 10 million times more power than electromagnetic waves at the same scale. (emphasis added). In case anyone believes that this has little chance of success, MIT highlights that one of the authors of the research has already achieved this with a remote controlled beetle. Are we to believe that “controlling it” has been left off the list for mere ethical reasons? Not likely.